JUST as scientists and inventors often make only a single really significant discovery in a lifetime, so successful painters also often appear to create just one truly unforgettable image, archetype or symbol. For a time, the "symbol" is all-consuming, and brilliantly focuses the painter's energies -- and the resulting works sometimes later mark the pinnacle of a career. Thus Sydney Nolan will be associated forever with the arresting image of Ned Kelly's black helmet, and Charles Blackman with his Alice in Wonderland series. 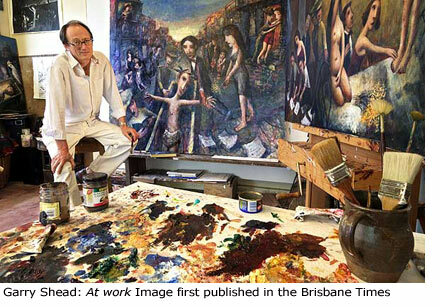 Perhaps 1993 Archibald Prize winner Garry Shead will go on to greater things, but at present his recent series of paintings inspired by D. H. Lawrence's Kangaroo -- and dominated by the images of a mystical, mighty kangaroo -- represents his most exciting work to date. For decades, Shead has, as he puts it, been caught in "a kind of Lawrencian web". The artist loved Lawrence's novels as a teenager and later became captivated by the coastal landscapes of Thirroul (so vividly described by Lawrence), now a northern suburb of Woollongong. In 1971, he collaborated with Brett Whiteley on a diptych, D.H. Lawrence at Thirroul, and even, strangely, met his wife in Vence, France, where Lawrence died. Little wonder then that Shead has pured his heart and soul into these extraordinary pictures. They reveal a pure vision of the artist's inner world which exists outside time, but also evoke so much of the concrete reality of the Thirroulian landscape, its people and animals. 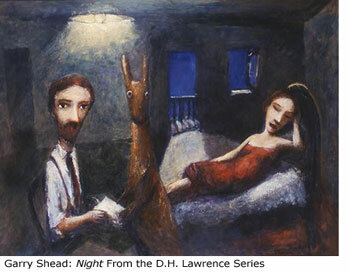 Shead's paintings unfold on several symbolic planes as he transforms the narrative of Lawrence's 1922 sojourn with his wife Frieda in the tiny village of Thiroul -- and the writer's involvement with 1920s Australian New right nationalist politics -- into a parable of European experience in Australia. From its brilliant blue seas, edged with hot pink sunsets, to its brooding, verdant cliffs, Shead portrays thirroul as an exotic Eden at the end of the earth. Moving through this dazzling Paradise are the tiny, childlike figures of Lawrence and his beloved, who grow with their love as they commune mystically with gigantic birds and an ever-present kangaroo and become fabulous beings, floating through space -- above the earth-bound, shadowy figures of Fascist Diggers tramplingthe British flag.